Despite the crackdown on cryptocurrency, the development of blockchain technology has found supporters in China, including tech companies and the government. 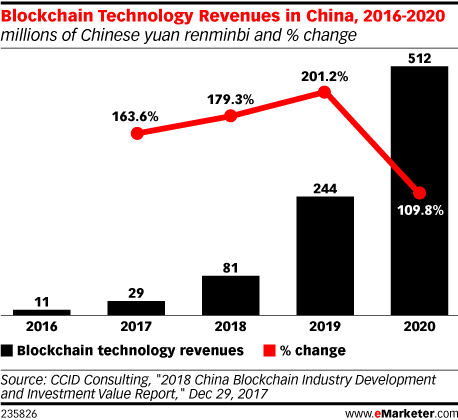 According to research by CCID Consulting, 550 blockchain technology-related patents were filed by companies in China as of 2017, against 284 from the US and 192 for South Korea. The core concept behind the technology is a distributed ledger in a network of computers that tracks and verifies every single transaction. The technology promises to decentralize consensus, authority and improve efficiency. Some of the largest tech companies in China, including Baidu, Alibaba, Tencent and JD.com, are leveraging the technology one way or another. Alibaba, for example—which has launched a number of aggressive measures to fight counterfeits sold on its platforms in recent years—partnered with logistics company Cainiao to track cross-border goods, including information on the manufacturer, port of dispatch, delivery and arrival, all by using blockchain technology. Moreover, the Blockchain Food Safety Alliance, formed by JD.com, IBM, Walmart and Tsinghua University, hopes to bring tractability, transparency and safety to the food supply chain—especially in a region where food safety is a concern for many of its 1.4 billion residents. In tests it conducted, the Blockchain Food Safety Alliance found that "by applying blockchain to trace food cut the time it took to trace a package of mangoes from the farm to the store to just 2 seconds," according to Forbes. So while Beijing did crack down on initial coin offerings (ICO)—as well as on domestic and overseas cryptocurrency exchanges—for fear of financial risks, blockchain technology has clearly found broader applications in other industries. And while the government is not afraid to intervene, it has taken steps to establishing a set of international blockchain standards. In October 2016, the authoritative Ministry of Industry and Information Technology (MIIT) published the “China Blockchain Technology and Applications Development Whitepaper” and followed with the “Blockchain Structural Guide” in May 2017.